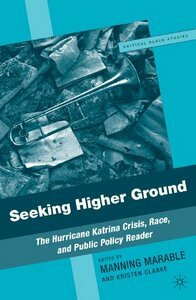 Publication by DPDF 2007 Black Atlantic Studies Fellow Chelsey Kivland in Seeking Higher Ground: The Hurricane Katrina Crisis, Race, and Public Policy Reader, edited by Manning Marable and Kristen Clarke. Hurricane Katrina of August-September 2005, one of the most destructive natural disasters in U.S. history, dramatically illustrated the continuing racial and class inequalities of America. In this powerful reader, Seeking Higher Ground, prominent scholars and writers examine the racial impact of the disaster and the failure of governmental, corporate and private agencies to respond to the plight of the New Orleans black community. Contributing authors include Julianne Malveaux, Melissa Harris-Lacewell, Ronald Walters, Chester Hartman, Gregory D. Squires, Mindy Thompson Fullilove, Alan Stein, and Gene Preuss. This reader is the second volume of the Souls Critical Black Studies Series, edited by Manning Marable, and produced by the institute for Research in African-American Studies of Columbia University. Kivland, Chelsey Louise, "Hero, Eulogist, Trickster, and Critic: Ritual and Crisis in Post-Katrina Mardi Gras," in Seeking Higher Ground: The Race, Public Policy & Hurricane Katrina Crisis Reader, ed. Marable, Manning and Clarke, Kristen (Palgrave Macmillan, December 2007), http://www.palgrave.com/page/detail/seeking-higher-ground-manning-marable/?K=9780230610095, 107-128.